Middle East Perspectives by Rick Francona: Yemen Acquits Al-Qa'idah Members - A Surprise? A Yemeni court has acquitted 19 suspected Al-Qa'idah members, some of whom had confessed to fighting American troops in Iraq. According to the judge, going to Iraq and joining the Al-Qa'idah in Iraq organization (formed by the late Abu Mus'ab Az-Zarqawi) and killing Americans does not violate Yemeni law. He went on to state that "Islamic shari'a law permits jihad against occupiers." 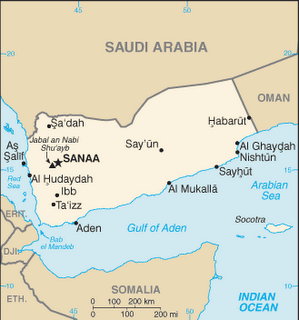 For years, successive U.S. administration have courted the government of first the Yemeni Arab Republic (also known as North Yemen) and later the unified Republic of Yemen as an ally in the Middle East. The American military, particularly the United States Central Command, made numerous (misguided, in my opinion) efforts to develop a close working relationship with the Yemeni military and government. They hoped that Yemen might allow CENTCOM to establish a headquarters in the country, or at the minimum provide staging for protection of the Bab Al-Mandab ("Gate of Tears") at the southern end of the Red Sea, a vital sea line of communications.